2 Season & Steam Bags of artichokes, cooked (4 artichokes. Use only chopped hearts, stems and bottoms). On a stove over medium high heat, add oil to a large cast iron skillet. Add and sauté fennel, green onions, bell pepper, and garlic until very tender. Add chopped cardone (optional). Add cooked cubed potatoes to veggie mixture in skillet and cook until potatoes are browned. Add cooked artichokes and basil. Sauté to combine. Pour beaten eggs, salt, and pepper over the cooked veggies in the skillet. 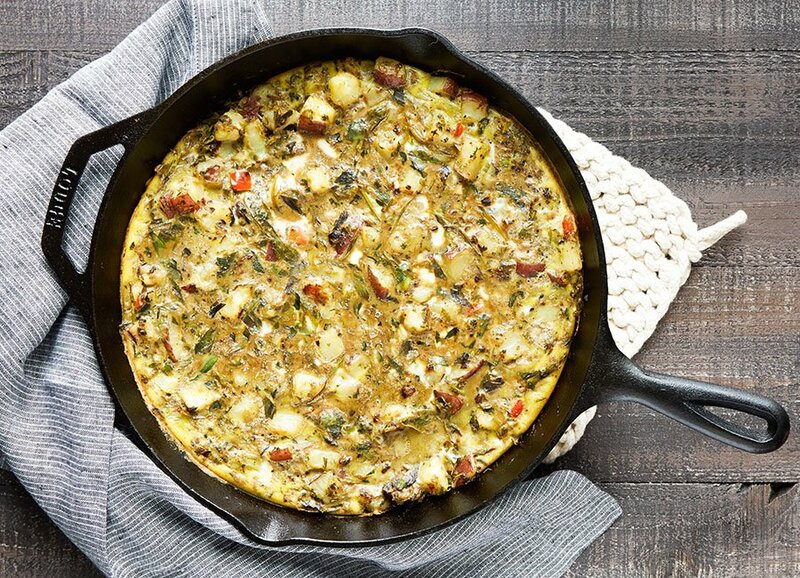 Place skillet in a hot oven and bake uncovered for 25 to 30 minutes or until eggs are set. Cut into wedges and serve in the cast iron skillet.